The Sermons on Joseph attributed to Balai of Qenneshrin (early 5th century CE) is a masterpiece of early Syriac poetic homily and biblical interpretation, yet this work has remained virtually unexplored. 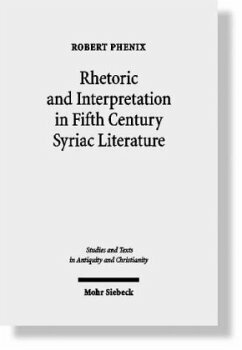 In the present study, Robert Phenix examines all facets of the work: the attribution to Balai, his historical and cultural background in Qenneshrin and Beroea/Aleppo, the interactions between Jews and Christians in Central Syria, and the relationship of this story to other sources, including Pseudepigraphical Joseph material, Syriac and Greek Christian sources, Jewish exegetical works from Late Antiquity, and Qumran. The purpose of the work is to demonstrate the rhetorical and literary heritage of the author, a combination of Hellenistic rhetoric and literary themes that are found in other early Syriac writers such as Ephraem the Syrian. Robert Phenix: Born 1973; 2005 PhD; 2008 Habilitation in the Languages and Cultures of the Christian Orient at the University of Tübingen; currently a temporary lecturer in Hebrew Bible and Ancient Israel at the Department of Theological Studies at Saint Louis University, MO, USA.